If you know that Analytics, Conversions, Tracking, Acquisition, Development are all connected, then we speak your language. Gott Advertising is an online advertising agency that runs search engine marketing & social media advertising campaigns for nonprofits. We know that to achieve a variety of client goals, with varying costs, on multiple ad platforms, with short term results shaping budget decisions daily, Analytics are very, very important. 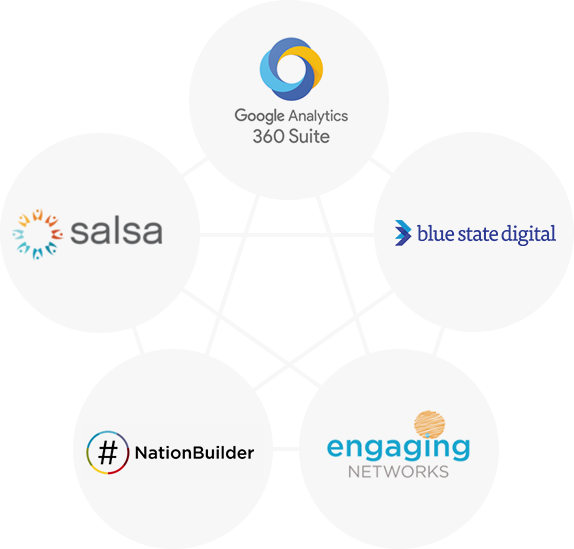 Analytics is the way we’re taking the apples to apples approach one step beyond our ad campaigns, so that Google, Bing, Facebook & Twitter are speaking the same language as your CRM & email platform, Salesforce, Engaging Networks, Nationbuilder, Blue State Digital, Convio and more. We employ an Analytics audit within all client campaigns on the front end of launch, and include ongoing troubleshooting. We can also provide training to give your internal team more familiarity with all the tools and the dots that connect them so Analytics can provide actionable insights beyond a short term engagement or long term retainer.